SUBHEAD: Bacteria exposed to radionuclides may become resistant to and capable of detoxifying soil. 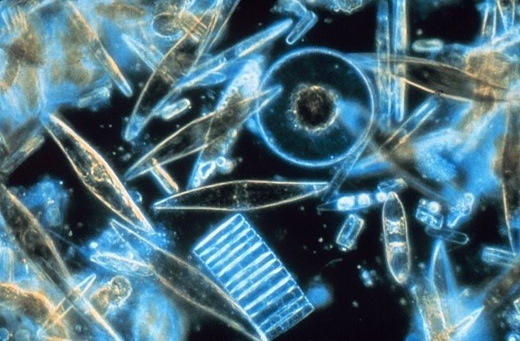 Image above: Microscopic view of diatomaceous earth. It is essentially the crushed fossilized remains of microscopic sea creatures. These tiny jagged shells also have incredible absorptive properties. From (http://outdoorblogging.com/use-diatomaceous-earth-deter-garden-pests-safelyfor.html). In "The Biochar Solution" we suggested that biochar's highest purpose might lie less in its capacity to increase global food security and more in its power to restore Earth's ecological balance and return us to the comfortable Holocene that was the cradle of civilization — the only Earth we have known until very recently. Now that our sciences have cracked the ancient code for "Terra Preta" — the Amazonian Dark Earths — and discovered the miraculous quantum entanglement of a microverse below our feet, in our guts, in the transfers between ocean and atmosphere, in the flow of nutrients from sunlight to cells there are a great many new biochar solutions that are rapidly coming into view. One of these solutions may be remediation of radioactively damaged soils. That story can be found amid a remarkable collection of science articles recently published by CRC Press under the catchy title, "Geotherapy: Innovative Methods of Soil Fertility Restoration, Carbon Sequestration, and Reversing CO2 Increase", edited by Thomas J. Goreau, Ronal W. Larson, and Joanna Campe. Chapter 31 of "Geotherapy" is an insightful look at the Fukushima disaster and the reaction and response of soil microbes (Kazue Tazaki, Teruaki Takehara, Yasuhito Ishigaki, Hideaki Nakagawa, and Masayuki Okuno, "SEM-EDX Observation of Diatomaceous Earth at Radioactive Paddy Soils in Fukushima, Japan"). In case you were thinking, after reading our post last month, that all hope for Japan is lost, hold on. It ain't necessarily so. A small group of Japanese scientists began using diatomaceous earth, which as a soil amendment works essentially the same way that biochar does. Diatomaceous earth is a white powder made from the remnant shells of fossil diatoms and clay minerals. It has long been useful to organic gardeners because of its calcium content, micropore structure and abrasive shell edges that can deter ants and termites. It is widely used for soil improvement, compost, fertilizer with oyster shells, as a desiccant, or for filtration and other purposes. Diatomaceous earth works to increase soil bacteria and fungi in the same way biochar does. Biochar, however, can be made anywhere, by anyone, and diatomaceous earth must be mined and transported from places, such as coastal areas, where it can be economically recovered. According to Tazaki, et al., diatomaceous earth collected from coastal rice paddies around Fukushima in the months following the accident showed, at first, a concentration of radionuclides such as I, Cs, Ba, Nd, Th, U, Np, and Pu, "suggesting absorption of both radionuclide and stable isotope elements from radioactive polluted paddy soils." Coastal areas in Minamisoma City, Fukushima, Japan, were seriously damaged by the radioactive contamination from FDNPP accident that caused multiple pollutions by the tsunami and radionuclide exposure, after the Great East Japan Earthquake, on March 11 and 12, 2011. FDNPP leaked 17 kinds of radionuclides, such as 134Cs (1.8 × 1016 Bq; half-life time 2.1 years), 137Cs (1.5 × 1016 Bq; half-life time 30.0 years), 90Sr (1.4 × 1014 Bq; half-life time 29.1 years), and 95Zr (1.7 × 1013 Bq; half-life time 64.0 days) to the atmosphere and seawater in Japan (Atomic Energy Safety Agency, 2011). The paddy soils in Fukushima Prefecture have heavily been contaminated by radionuclides, especially by Cs (134Cs, 137Cs) and Sr (89Sr, 90Sr), even though more than 30 km north of the FDNPP. Tazaki's group took samples from several of the most heavily contaminated Fukushima soils and transported them to test plots. There the group set up more than 20 control garden beds measuring 2m x 2m, filled them with radioactive soils (averaging 1135 "cpm" or gamma counts per minute); and then applied different materials, such as zeolite, fossil shell, and chaff. The most effective reduction in radiation cpm were in the radioactive soils sprinkled with diatomaceous earth. What the group observed, over the course of 13 months (from August 8, 2011 to September 24, 2012) was a gradual down-migration into the soil profile for the radioactivity, and then a gradual elimination (equal to background) beginning at around 6 cm. In case you are saying, "Well that is to be expected with the decay of radionuclides," or "Must have just washed away in the rain," think again. Some nuclides, like 1-131 or Zr-95, are short lived, but others have half-lives of 30 years and more. Also, the scientists controlled for rain transport and measured that. The radiation decreased by about half in the first 3 months as the radionuclides migrated from the surface to 2 cm deep. It decreased by half again as it reached 4-6 cm. Nothing survived to reach 8 cm. The thicker the sprinking of diatomaceous earth (2 cm vs. 1 cm) at the surface, the more rapid the decrease in dose rate. Looking for possible explanations, Tazaki looked to see if it might have to do with chemical reactions. Diatom shells, 10–100 μm size, are mainly made of hydrous amorphous silica (SiO2 94% and H2O 6%). Diatomaceous clay is mostly SiO2 (67–75 mass%), Al2O3 (8.0–13 mass%), Fe2O3 (3.0–5.0 mass%), TiO2 (0.35–0.60 mass%), CaO (0.9–1.4 mass%), MgO (0.15–1.5 mass%), K2O (1.2–1.9 mass%), and Na2O (0.6–1.0 mass%), with pH of 3.5–4.5 (acidic). However, the chemical components of the diatomaceous earth were not significantly different than some of the other rock powder treatments used as controls, without any similar effect. Chemistry and ionic attraction could not explain the drop in radioactivity. Then Tazaki looked at the biology, and here is where we start to glimpse the potential for a biochar solution in the offing. "Abundant organic bubbles were found after H2O2 treatment, suggesting large amounts of microorganisms and organic materials" in the diatomaceous earth, the group reported. Moreover, when a chunk of biologically "charged" diatomaceous earth was dunked in muddy water containing 1135 cpm fallout from Fukushima, it sponged up radionuclides. The chunk of diatomaceous earth dipped in the muddy water absorbed large amount of dosage which transferred from the bottom (15 cm) to the surface (0–5 cm). … The diatomaceous earth showed high capabilities to adsorb radioactivity. In the soils, Takasi concluded, due to elemental similarity of K+ and Cs+, both ions are taken up by the same biological-metabolism-dependent transport systems. Bacteria, eukaryotic algae, fungi, and moss plants are known to absorb most radionuclides. Cs-137 and Sr-90 are partially adsorbed on the surface of clay minerals and fixed by microbiota, reacting the same as might potassium and ammonium. The stability of Cs-137 and Sr-90 depends on coexisting cations in the soils. Some radionuclides will move more quickly through the soil profile with rainfall, others more slowly. Microorganisms can interact with radionuclides via several mechanisms, some of which may be used as the basis of potential bioremediation strategies. Mechanisms of radionuclides–microbe interactions are biological sorption, bioaccumulation, biomineralization, biotransformation, and microbiologically enhanced chemical sorption. So, this explains how and why soil microbes concentrate radioactivity, and from what we already know of the "soil reef" effect, we can say that diatomaceous earth, like biochar, serves to give the microbes a conducive habitat in which to flourish, thereby speeding the sequestration process. But how does that explain the acceleration of decay in long-lived radionuclides? According to Takasi, bacteria exposed to radionuclides may become resistant to or even capable of chemically transforming and detoxifying radionuclides. He compares what is going on in the Fukushima soils to the microbial mats that biomineralize radiation in the radioactive natural hot springs in Japan, something that he studied and reported from 2003 to 2009. The bacteria produce extracellular polymers around the cells, which form capsules and slime layers, defending them from radiation. It is possible that radioactive biofilms and microbial mats are capable of immobilization of radioactive materials and can be used to counteract the disastrous effects of radionuclides polluted water and soils. So what apparently happens is that not only are radioactive materials concentrated by bacteria and fungi, but they are also absorbed into biofilms and microbial mats, where they are digested and made part of a slime layer that apparently absorbs errant electrons, neutron/proton-pairs, gamma and x-rays so that they cannot escape to be detected by radiation metering equipment, or for that matter, to damage healthy cells or disrupt delicate DNA/RNA exchanges. You can set your atomic clock by the standardized rate of decay (as the Navy's Bureau of Standards does), and that will never change. Once set in motion, only time can defuse a nuclear decay chain. Takasi does not suggest that the radiation has vanished. What his study suggests is nonetheless hopeful, because it says biological systems, given the right conditions, can safely entrap radionuclides and their emissions in a slime that keeps them inert and unable to harm anyone. In "Mycelium Running", mycologist Paul Stamets describes a similar process, where fungi excrete a digestive fluid that entombs toxic salts inside a waxy coating so that the toxins are incapable of solubilizing or being transported up the food chain. This is precisely what Geoff Lawton observed and reported in Greening the Desert, when he was able, through the magic of the soil-food-web, to "desalinate" (actually entrain) a swath of Jordanian desert and turn it back into a garden. We are surrounded by allies who want nothing more than to heal the planet and take us back to the garden. It is time we got out of their way and stopped giving them more work than they can reasonably handle all at one time.